The island was the site of the only World War II land battle fought on the continental United States (the Battle of Attu), and its battlefield area is a U.S. National Historic Landmark. Attu Station, a former Coast Guard LORAN station, is located at 52°51′N 173°11′E﻿ / ﻿52.850°N 173.183°E﻿ / 52.850; 173.183, making it one of the westernmost points of the United States relative to the rest of the country. However, since it is in the Eastern Hemisphere, being on the opposite side of the 180° longitude line as the contiguous 48 states, it can also be considered one of the easternmost points of the country (a second Aleutian Island, Semisopochnoi Island at 179°46′E, is the easternmost location in the United States by this definition. In the chain of the Aleuts, the next island to the west of Attu are the Russian Commander Islands, 208 miles (181 nmi; 335 km) away. Attu is nearly 1,100 miles (960 nmi; 1,800 km) from the Alaskan mainland and 750 miles (650 nmi; 1,210 km) northeast of the northernmost of the Kurile Islands of Russia, as well as being 1,500 miles (1,300 nmi; 2,400 km) from Anchorage, 2,000 miles (1,700 nmi; 3,200 km) from Alaska's capital of Juneau, and 4,845 miles (4,210 nmi; 7,797 km) from New York City. 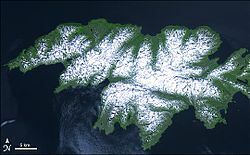 Attu is about 20 by 35 miles (32 by 56 km) in size with a land area of 344.7 square miles (893 km2), making it #23 on the list of largest islands in the United States. The population in the 2010 census was 20 people, all at the Attu Station, though all inhabitants left the island later in the year when the station closed. It is the largest uninhabited island in the United States. Although Attu Island is the westernmost body of land east of the International Date Line, its time zone is the same as other western Aleutian Islands, UTC−10, which means that locations to the south-southeast (such as the uninhabited Baker Island and Howland Island in UTC −12 and Niue, Midway Atoll and American Samoa in UTC −11) have earlier clocks. The name Attu is a transliteration of the Aleut name of the island. It was called Saint Theodore by the explorer Aleksei Chirikov in 1742. Attu, being the nearest to Kamchatka, was the first of the Aleutian Islands exploited by Russian traders. The first population estimate by the Russians put at most 175 Aleuts on Attu. However, the large number and size of archeological sites on Attu have led to estimates of 2,000–5,000 inhabitants during the centuries preceding European contact. Russians would stay several years on the island hunting sea otters, often clashing with the local Aleut population. After the initial wave of traders, Attu was largely overlooked by ships heading further east. The Aleuts were the primary inhabitants of the island prior to World War II. But, on June 7, 1942, six months after the Japanese attack on Pearl Harbor, the 301st Independent Infantry Battalion of the Japanese Northern Army landed on the island, without opposition, one day after landing on nearby Kiska. 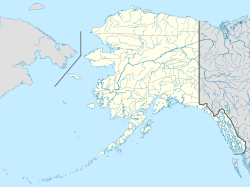 Earlier, American territorial authorities had evacuated about 880 Aleuts from villages elsewhere in the Aleutian Islands to civilian camps in the Alaska Panhandle, where about 75 of them died of various infectious diseases over two years. The island previously had scheduled airline service to and from Anchorage (ANC) flown by Reeve Aleutian Airways (RAA) which in 1976 was operating two direct flights a week between ANC and Attu with Lockheed L-188 Electra turboprop aircraft via an en route stop either at Adak Airport or Shemya in the Aleutian Islands. At the time, the airport on Attu was the westernmost airfield located in the U.S. to have scheduled passenger airline service. Attu first appeared on the 1880 U.S. Census as the unincorporated Aleut village of "Attoo",  which at the time consisted of the village on western Chichagof Harbor. It had 107 residents, consisting of 74 Aleuts, 32 "Creoles" (mixed Russian and Native) and 1 White resident. In 1890, it appeared as Attu. It did not return as Attu again until 1930. It also appeared on the 1940 census, a few years before the Japanese invasion of the village and island. It did not return again until 1980, when it consisted of the naval station residents at Massacre Bay, and was made a census-designated place (CDP). It did not return on the 1990 census. The name was changed to Attu Naval Station and redesignated a CDP in 2000. It appeared lastly on the 2010 census, just before the closure of the station in August that year and the departure of its remaining residents. The weather on Attu is typically cloudy, rainy, and foggy. High winds occur occasionally. Five or six days a week are likely to be rainy, and there are only about eight or ten clear days a year. The rest of the time, even if rain is not falling, fog of varying density is the rule rather than the exception. There are 39–49 inches (990–1,240 mm) of annual rainfall and other precipitation, with the heaviest rains in the autumn and early winter. According to the Köppen climate classification system, Attu has an ocean-moderated subarctic climate (Dfc) closely bordering on a tundra climate (ETf) For its latitude the climate is exceptionally chilly, with daytime maximum temperatures averaging mid-50's in summer. ^ Bergsland, Knut (1994). Aleut Dictionary. Fairbanks: Alaska Native Language Center. ISBN 1-5550-0047-9. ^ Corbett, Debra G.; et al. (2008). "Aleut Hunters, Sea Otters, and Sea Cows: THREE THOUSAND YEARS OF INTERACTIONS IN THE WESTERN ALEUTIAN ISLANDS, ALASKA". In Rick, Torben C.; Erlandson, John M. (eds.). Human Impacts on Ancient Marine Ecosystems: A Global Perspective. University of California Press. ISBN 0-5202-5343-4. 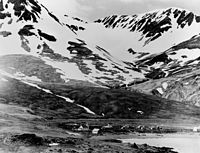 ^ a b "Attu Battlefield and U.S. Army and Navy Airfields on Attu". National Historic Landmark summary listing. National Park Service. Retrieved 2008-01-08. ^ a b Breu, Mary (2009). Last Letters from Attu: The True Story of Etta Jones, Alaska Pioneer and Japanese POW. Alaska Northwest Books. ISBN 0-8824-0810-0. ^ a b Mitchell, Robert J.; Tyng, Sewell Tappan; Drummond, Nelson L., Jr.; Urwin, Gregory J. W. (April 2000). The Capture of Attu: A World War II Battle As Told by the Men Who Fought There. University of Nebraska Press. pp. 2–3. ISBN 0-8032-9557-X. ^ "Japan seeks WWII soldiers' remains on U.S. soil". CNN. Associated Press. June 3, 2008. Archived from the original on June 4, 2008. ^ D'Oro, Rachel (June 4, 2008). "U.S. helps search for Japanese dead on Attu". The Japan Times. Associated Press. Archived from the original on June 6, 2011. ^ D'Oro, Rachel (June 1, 2008). "Searchers find Japanese remains on Attu Island". Anchorage Daily News. Associated Press. Archived from the original on May 16, 2013. Retrieved March 25, 2013. ^ Paulin, Jim (August 31, 2012). 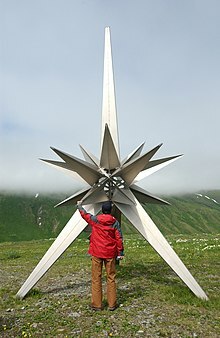 "Memorial placed in Attu honoring villagers". The Bristol Bay Times. Archived from the original on October 29, 2017. Retrieved April 6, 2015. ^ "STORY". Voyage of the Southern Sun. Retrieved October 4, 2017. ^ Elphick, Nicole (August 27, 2017). "Plane sailing with an Aussie adventurer". The Sydney Morning Herald. Retrieved October 4, 2017. ^ Orth, Donald J. (1971). Dictionary of Alaska place names (PDF). Washington, D.C.: U.S. Government Printing Office. ^ "ATTU, AK (500452)". Western Regional Climate Center. Retrieved November 18, 2015. ^ Waters, Christa (2003). Attu: Birding on the Edge. American Birding Association. ISBN 978-1-87878-831-3. ^ Komito, Sandy (1999). I Came, I Saw, I Counted. Bergen Publishing Company. ISBN 978-0-96705-010-2. ^ Corey (May 5, 2010). "A Brief Interview with Al Levantin". 10,000 Birds. Archived from the original on November 11, 2017. Retrieved Jan 24, 2014. ^ "NARBA Big Year Standings". Retrieved Oct 24, 2015. ^ " Attu Before the War." National Park Service. Retrieved on March 12, 2017. "The BIA school had a white teacher and her husband." ^ "Alaska Public School Districts" (PDF). Alaska Department of Education. June 2013. Archived (PDF) from the original on September 30, 2017. Retrieved March 12, 2017. Wikimedia Commons has media related to Attu Island. 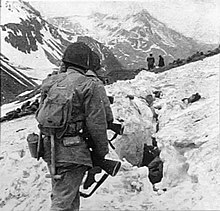 Suicidal Banzai charge in Attu : The 1st Gyokusai ordered (in Japanese) Suicide for the Emperor?